I spent the last day of my vacation busily finishing up the odds and ends of The Great Coat Closet Remodel Project. It took me most of the day Friday and part of Saturday morning to get the trim installed. The two inside walls were fairly straight forward, but the exterior wall was problematic. 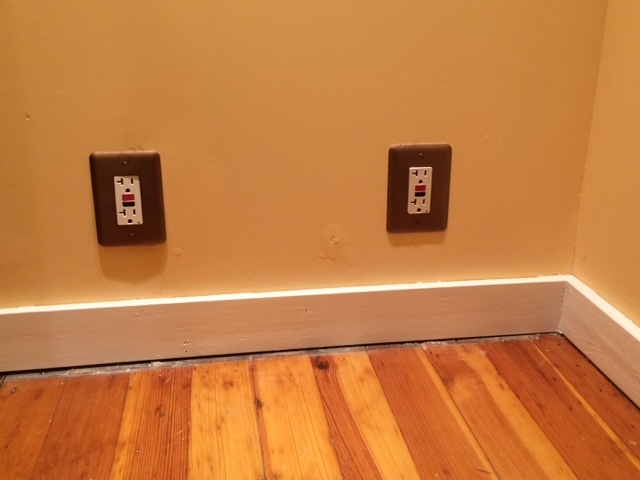 The uneven area that could be seen in my last post prevented the baseboard from lying flat against the wall. 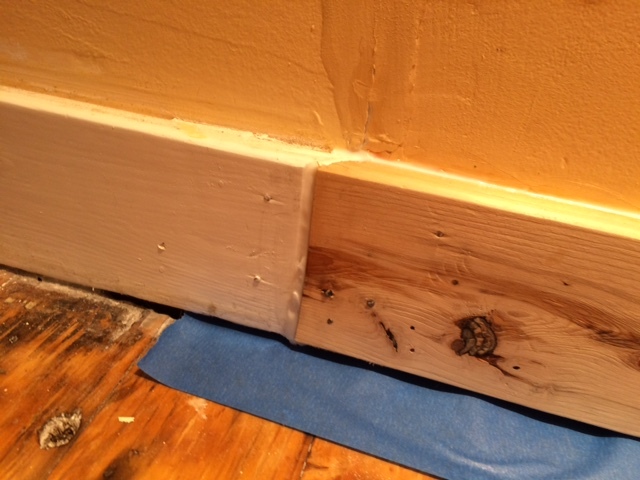 I used a putty knife to smooth the area as best I could, but still could not get the baseboard to set flush. Finally, we made a trip to Home Depot to procure a box of 2 inch finish nails (I had been successfully using 1-1/2 inch finish nails up to this point.) Steve got the “big” hammer and used the 2 inch nails to secure the baseboard in place. I then sanded the join to transition more smoothly into the existing baseboard section. And then I applied my mad caulking skills to fill the remaining gap. I reinstalled the door frame, using the existing holes in the frame as reference points to make sure all the pieces were positioned properly. I then caulked all the baseboards, and around the freshly installed door frame. After applying the caulk, I was pretty well exhausted so I knocked off for the day. Sunday morning, I got up early and taped off the baseboards for painting. With everything taped off, I painted the baseboards and the door frame. While I waited for it to dry, I installed and caulked the exterior trim of the door. I then applied the second coat of paint to the baseboards, and a coat of finish paint to the exterior trim. I secured the armored cable around the door frame. (It will be secured more permanently once I install the coat hooks along the wall.) 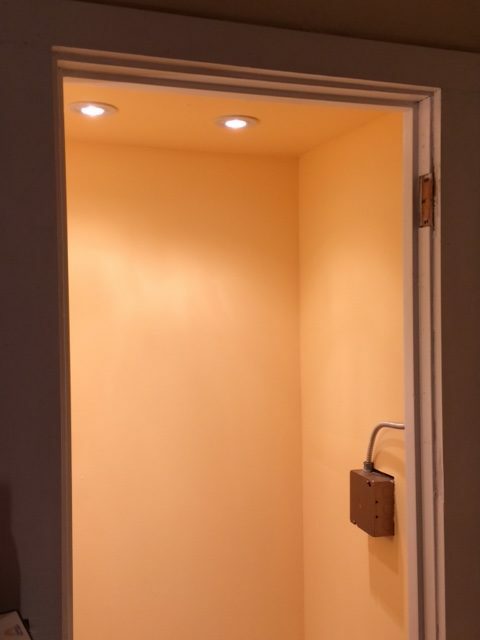 And I installed the electrical face plates, and touched up the wall paint in a few places. There are still a few finishing construction touches to come. 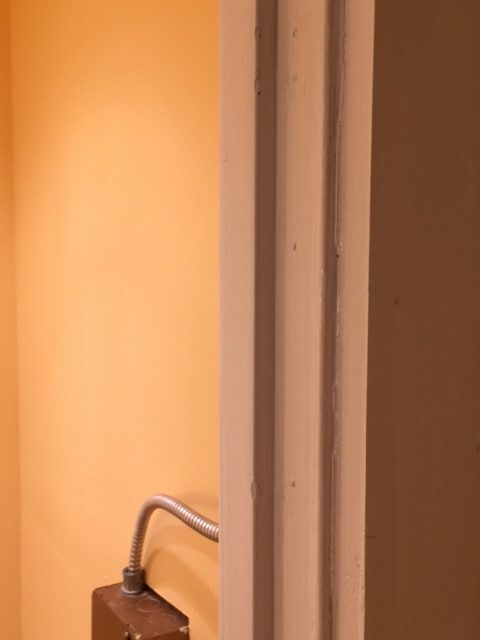 Once the paint is fully cured, we will rehang the door of course. I intend to install some quarter round along the inside corners where the drywall meets the door frame, just to give it a more finished look. 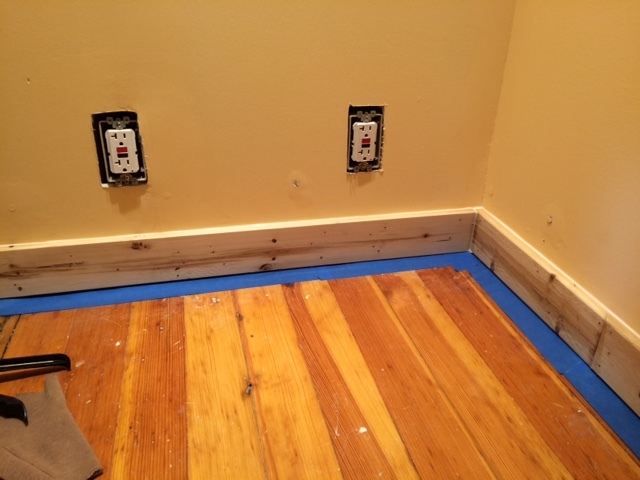 I want to install some shoe moulding along the baseboard in the front part of the closet as well, to minimize wear and tear on the baseboards, and to cover the discoloration of the floor boards where the original moulding was installed. Also, I was unhappy with the final look of the switch plate, so I plan to replace it with something that I like better. At this point, we are ready to select and order the coat hooks and shelves for the closet, as well as some pegboard for storing tools, since this closet will be pulling double-duty. 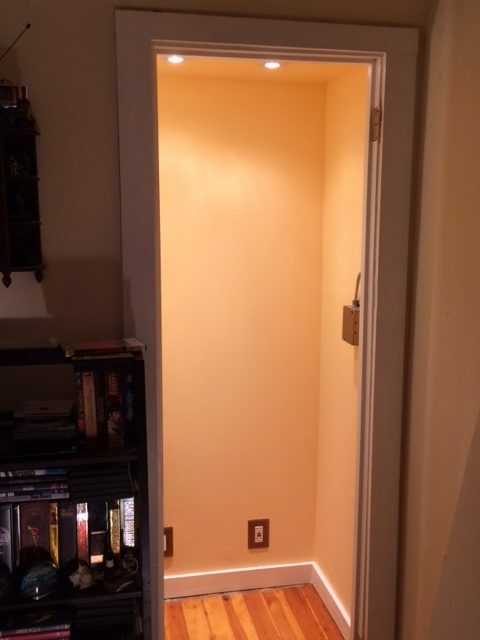 I will have a couple of denouement posts highlighting the finishing touches to the construction, as well as the dressing of the closet for use, but for now, The Great Coat Closet Remodel Project is complete. I am proud that we did all the work ourselves, and I could not be happier with the results. And I can feel that our home is happy as well! OMG!! Congratulations!!! Could you refresh our memory by posting before and after pictures, also? Wasn’t there a water heater in that closet at one time? Your work looks incredible! Thank you so much! Yes, I will do a before and after post. Great idea!